One of the most wonderful things about creating jewelry, is having the ability to compose designs that are truly unique. Mixed media designers are especially lucky, for their palettes don’t just include bead shapes and colors, but the whole world and its history. If you enjoy making one of a kind jewelry, crafting your own beads and components, and mixing unique elements into your work, Tales of Adornment will help you discover new ways to build your own distinct pieces. By combining a variety of materials and techniques with versatile resin, Kristen Robinson creates antique inspired designs that are intriguing and elegant. Creative beaders can use her lessons and projects to make their own memory jewelry, vintage inspired baubles, contemporary designs, and even steampunk pieces. Tales of Adornment begins with a very detailed introduction on the techniques used in the book’s 18 jewelry projects. Kristen covers the basics, like crimping and wrapped loops, and even two methods for making your own jump rings. She also gives step by step directions for mixing resin, making molds, etching metal, and hand dying ribbon to match your designs. The projects are divided into three chapters: Using and Making Bezels, Using and Making Molds, and Being Creative with Resin and Resin Clay. Each chapter offers a variety of different approaches to designing with resin and found objects, and will give even new jewelry makers plenty of instruction and inspiration to get started. Kristen combines jewelry essentials like beads and chain with a wide variety of materials such as vintage paper, tulle and ribbon, Faux Bone, and even spices! My favorite project combines vintage fashion plates with handmade roses, ribbon, and pearls for a very feminine and delicate bracelet. Readers will learn how to make attractive bezel pendants, cast favorite objects in resin replicas, and make faux sea glass, as well as design classy jewelry with a hint of mystery. Some projects are beginner friendly, using products that you can buy at any bead or craft store, while others require investing in some heavier duty jewelry tools. Each project is introduced by delightful prose that sets the mood for the featured design, and can inspire future projects with an antique flair. 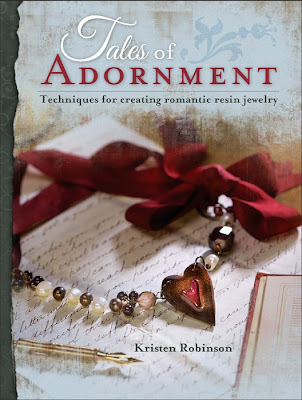 Tales of Adornment concludes with a detailed list of key materials and tools with tips on how to use them, plus a handy resource guide and alphabetical index. The only thing that’s missing is an inspiration gallery, but the projects will have you wanting to make your own! I would like to thank North Light Books and F+W Media for giving me the opportunity to preview Tales of Adornment. Inspirational Beading has not received compensation or merchandise in exchange for this review. I have shared my sincere impressions of this book. That looks like a very intersting book to me. I just recently became interested in resin clay and have been looking at books like Inspired Remnants, Curious Dreams as I want to buy something for inspiration and how-tos. Now I got a second book on the subject to consider whether to buy. Decisions, decisions. Sounds like a great book! Will have to look for it the next time I'm in the book store. Thanks for sharing, Morti! Thank you so very much for the lovely review and post. Have a lovely week. It sounds like a fascinating book! You are most welcome, Kristen! And thanks to everyone for taking a look! 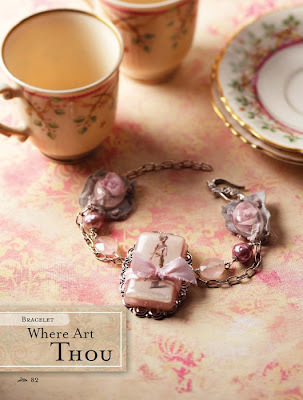 This is a really fun title for mixed media lovers.